This play is the story of one woman's love for the natural world and her fight to defend it. It is the story of the extremely private Rachel Carson thrust into the role of controversial public figure. "Silent Spring played in the history of environmentalism roughly the same role that Uncle Tom's Cabin played in the abolitionist movement. In fact, EPA today may be said without exaggeration to be the extended shadow of Rachel Carson," wrote Jack Lewis in "The Birth of EPA", Environmental Protection Agency Journal in November 1985. Join us for an Earth Month Open House: Call to Environmental Action at 5:30 – 7 p.m. in the Canyon Gallery and library gardens. April is Earth Month, and a variety of area events are planned to encourage our community to reflect and focus on climate action. In addition to Earth Month, the city is coordinating other programs and events throughout the rest of the year to focus on the significant role ecosystems (forests, streams, wildlife habitats, agricultural and urban areas, and more!) can play in addressing and responding to climate change. A better understanding of these connected systems can help the community meet its Climate Commitment goals. Visit https://boulderlibrary.org/seed-to-table/ and beeboulder.org for more details. Generously sponsored by the Boulder Library Foundation, Boulder Public Library, Integrated Pest Management. A Sense of Wonder, written and performed by Kaiulani Lee, has been touring the United States for 24 years. The play has been the centerpiece of regional and national conferences on conservation, education, journalism, and the environment. She has performed it at over one hundred universities, dozens of high schools, the Smithsonian Institute, the Albert Schweitzer Conference at the United Nations, at the Department of the Interior's 150th anniversary, and in 2007 performed on Capitol Hill, bringing Miss Carson’s voice once again to the halls of Congress. A Sense of Wonder has played in every Provence of Canada, in England, Italy, India, and Japan. 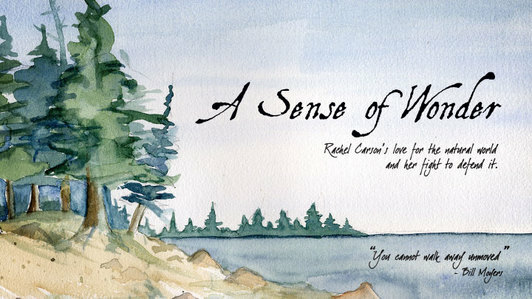 A Sense of Wonder has been created with the help and guidance of many of Miss Carson's friends and colleagues and with permission from the Rachel Carson estate. Act One takes place in Miss Carson's summer home as she is preparing to leave. Fighting cancer, she fears this may well be her last visit to her beloved Maine coast. Act Two begins two months later in the wake of the furor over her book Silent Spring. Carson is simultaneously battling the chemical industry, the government, and the press to get her message to Congress and the American people. Rachel Carson has been called the "Patron Saint of the Environmental Movement." She was a marine biologist and zoologist best known for her book Silent Spring. which alerted the world to the dangers of chemical pesticides and launched our modern environmental movement. Less known is that Miss Carson was one of America's great poets of the natural world. In her earlier works, she brought alive the beauty and mystery of the seas and its creatures to millions of readers.